Are you a parent of a child born with Down syndrome, we’d like to hear your story. Click here to share your story! Click here to sign up to receive updates from Hope Story. Do You Have a Website / Blog? Ivy was a twin and we lost her sister at 12 weeks. Because of that partial miscarriage, we were being monitored more closely. They saw an echogenic cardiac focus on the 21 week ultrasound so we were sent to maternal fetal medicine for a more comprehensive look. We decided to do the amnio not because it would change our decision to keep and love Ivy but so that we could be prepared. We were blessed by wonderful doctors and other care providers all around through diagnosis and delivery. Ivy was born 4 weeks and a day early. Because we already knew about her extra chromosome, we were able to just focus on the joy of bringing her into the world. She was born very healthy and didn’t need any NICU time. Exactly the same as bringing home our other babies! Ivy was super healthy and we had no surprises for the first 2 1/2 months. She nursed great, and was rocking life! Around 2 1/2 months she started to struggle with eating. 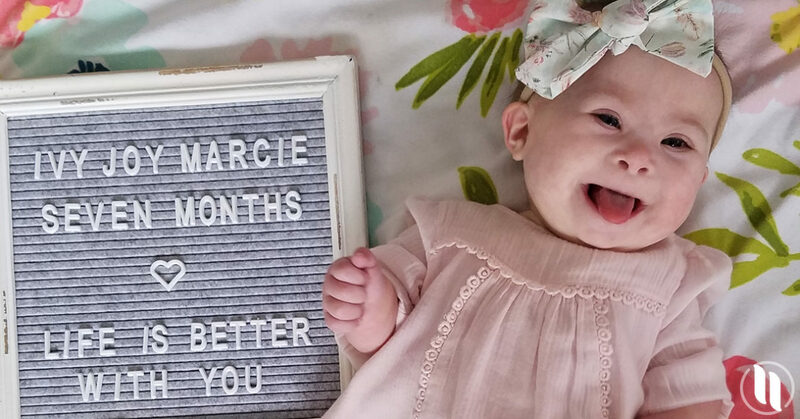 She couldn’t figure out a bottle at all, and began having much shorter nursing sessions. She was diagnosed with pretty significant reflux. She got sick and had a chest x-ray just to rule out pneumonia. Thankfully, that was negative, however they found a surprise diaphragmatic hernia that we hadn’t previously known about. Her eating continued to be a problem, and it was decided to place a GJ tube to help her get the calories she needed. She received surgery to repair her diaphragmatic hernia and place the tube a month ago. She is progressing slowly in all areas, but we are working hard! Through everything she has been so content and such a brave, strong girl. Hands down the best part is becoming a part of this amazing tribe of parents that I never really knew existed. I was welcomed with open arms and have been so loved and supported. I also have had such a perspective shift on what is truly important in life. Ivy has helped me celebrate every moment and every small milestone reached. My eyes have been opened to the world of differently abled people and their families, and oh man is it amazing. This is never where I imagined myself, but being thrust into this role is the best thing I never knew I needed! We love to play games and have fun together. We also love to visit the zoo when it’s warm! Ivy’s feeding struggles have been the toughest thing we’ve faced. I’m realizing it is going to be a long road of therapy and figuring out what works to get her to eat 100% orally. I’ve dealt with anxiety and stress trying to juggle all the therapies and appointments. It definitely hasn’t been easy, but it has been so worth it. It’s ok to feel all the feelings right now and process/grieve the fact that life will be different from the expected. But you will move past all of those feelings and you will find the biggest joy with this child. She will be more alike your other kids than different. She will open your eyes to so much. You will be welcomed, supported, and loved by a whole new tribe of people who understand you to your very core. This sweet baby will make the highs higher and the lows lower. She will help you appreciate every moment and every achievement. This is the best thing you never wanted to happen to you! Congratulations! You are one of the lucky few! I had somebody tell me that having a baby with Down syndrome is like finding a four leaf clover. They are rare, and almost exactly like three leaf clovers just with a little something extra. Allow yourself to feel all of the feelings you are right now. It’s ok to cry and mourn what you thought would be. But then take a deep breath and prepare for an amazing journey. Your child will be special, and beautiful, and so very loved. He/she will teach you so much and change you to your very core. Connect with other parents on this journey. They will help and support you and it is invaluable to have people who understand you completely!